As everyone knows, there are 24 official NAF ranked teams, but there are also rules available for Khorne, Apes and Bretonnian (as well as a host of less commonly used teams). 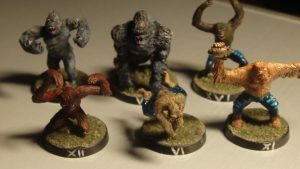 I’ve played Khorne in the Cakebowl league and at a UKBBL tournament, and recently(ish) picked up the Apes of Wrath team in the Impact Kickstarter in order to use it in the league and as a proxy at NAF tournaments. I’ve also played them in a league on Fumbbl, which is their main home (Khorne are from Cyanide’s BB1, and Bretonnian from BB2). 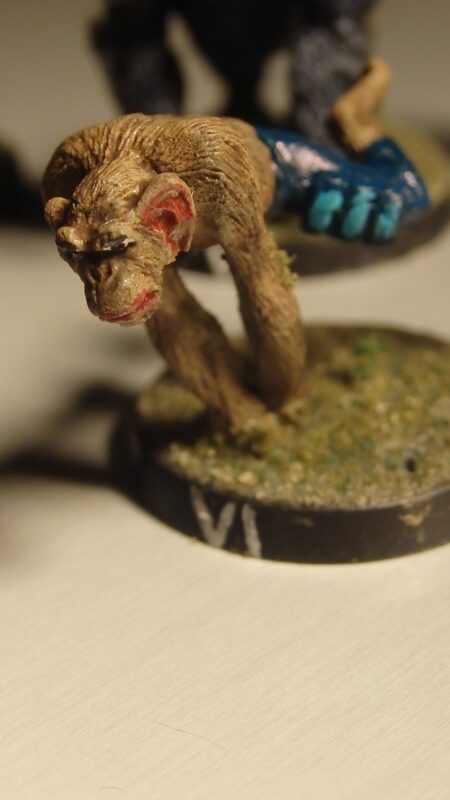 After a few troubles with undercoating the Trollcast, I used acrylic white that I happened to have lying around, and that took really well, and after that this was one of the quickest teams I have ever painted, as there is lots of hair! I left the body armour off the gorillas, as there is always the option to add it later, perhaps if they do well in the league they can earn it. Using the figures is absolutely brilliant, they look excellent as they move down the pitch, so I’m looking forward to using them at tournaments. 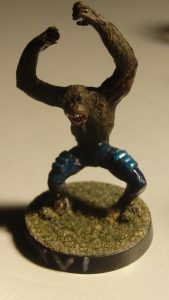 First up will be as Pro Elves at ARBBL Pick N Mix, with a couple of gorillas as blitzers, chimps as catchers, orangutan as throwers and bonobos as line-elves. The ball handing fits the monkey theme really well. The other positional is the gibbon, but not sure how often he will get used. I’ve painted up a squad of 19 so far, with hopefully one more chimp flying over from Sweden to make 20, as the chimps work well as catchers, and sometimes 4 of those are good. Haven’t decided yet whether I will use the Apes on Day 2 as well as proxies for Vampires – only 7 Bonobos, so the Gibbons may get to be thralls as well depending on the team build! 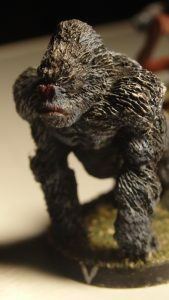 Or I may use traditional vamps, as the idea of blood-sucking Gorillas is a bit creepy.